Mr. Giovanetti will review what President Trump has done on trade, will be doing on trade and should be doing on trade. 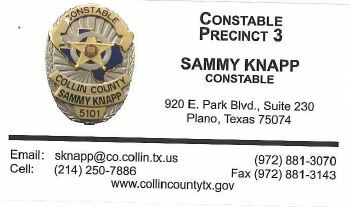 Please join CCRMC on Thursday April 18 at Collin County Republican Headquarters, 2963 W. 15 St, Plano TX 75075. Meet and greet begins at 6:30 pm with meeting at 7:00 pm. Light refreshments will be served. One of the biggest support arguments for this bill is to let the voters decide apart from the previous election of the officials. The basic bill calls for an election if the overall tax proceeds exceed a 2.5% increase. The 2.5% seems to be a random, sounds good number without little thought for the differences in city operations. Arguments against the bill would be to limit state inference in local control of taxes and expenses. These items are controlled by a locally elected government that can be changed at each election cycle. Republicans believe in local control. For example, the State does not want inference from the Federal government and the local governments do not want inference by the State government. The randomly chosen 2.5% can burden a city with a costly election and fails to identify the differences in city revenues and growth factors. For example, some cities have a very high sales tax revenue and fee revenue generating up to, and over, 50% of the city revenue. That means that approximately 50% of the revenue is property tax. In other cities, sales tax may only be 10-20% of the revenue and the remainder property tax. The one size fits all 2.5% state mandated rate does not work. One of the biggest arguments against is the raw cost of special elections. In the early version of the bill, the election was expected to be the November election. That process is easy in even numbered years but in odd numbered years, there may not be a scheduled election which can be very costly. This has been amended to the regular May elections but many cities have and unopposed slate that would not require and election. Additionally, there is a city cost to be on the ballot with the elections office so scheduling it with a routine election has an inherent cost, often polling places in the city that are required. While the Legislature pretends to be “reducing” property taxes with this bill, it really would have little effect. School taxes are already capped at .67 / per 0 so this bill is primarily focused on city elections. What the Legislature does not want to admit is that THEY are stealing the money from the property taxes to balance the State budget. First, the schools began a downward spiral in State financing after the tax act of 2007 dictated a cap on the school tax with assurances that the State would fund the schools. In the first budget after than in 2009, the State realized that the budget could be billion to billion short if they were to fund the schools. Their solution was to take some of the shortage out of the “rainy day” savings account, a bad choice for a recurring expense. Second, they continued the “Robin Hood” plan that had been put in place in the 1990s where the State took money from “property rich” school districts (recapture was the nice word) and therefore the State was requiring local districts to use their property tax revenue (the only source of revenue except for State funding) to support underfunded districts in a bizarre formula. In 2019, Plano ISD will send 0 million of the residents of Plano property tax to the State to fund districts that the State will not fund properly. Under the radar, the State also takes revenue from the cities under the caption of “fees.” Merchants collect the city’s 1% sales tax and submit that to the Comptroller’s department along with the State’s 6.25% and the other 1% which can be a transit tax or economic development tax. When the State returns the city’s 1%, they only return .98% maintaining a fee of 2% of the 1% as the handling charge. These accumulated fees are more than the State Comptroller’s budget allowing the State to collect their 6.25% for free. The difference is made up in property taxes. Also, cities are expected to provide law enforcement for the safety and protection of their citizens. A part of that is traffic enforcement. The city provides vehicles, equipment, officers, courts, and overhead to collect traffic fines. The State requires the city to pay the State approximately of the fine collected. The balance of the city budget is funded by property taxes. The 2.5% cap is the State pandering to the populist vote that they are “helping” with property tax relief. The real solution is for the State to properly fund public education, let the cities operate with the revenue they deserve without hidden fees and property taxes would reflect that on a local budget. The State has already failed to fund roads and have deferred that to toll road system in the major cities. If your car gets 25 mpg, a toll tax of $.18 per mile is a .50 per gallon “tax” for underfunding road construction. How does the State balance their budget without stealing from the school districts or cities? Their only choice is to reduce spending or increase revenue. Probably the best choice would be an increase in the fuel tax so that non-residents and heavy trucks that travel the Texas roads contribute to the welfare of the State. In the end, this tax would provide real relief in the excessive property taxes caused by the State’s unofficial use of local property tax and allow road construction in the State without toll roads. Additionally, the State could develop a strategy to buy back the toll roads with bonds paid by fuel taxes and get rid of the excessive gas tax in those targeted cities with toll roads. You will definitely want to mark your calendar to attend CCRMC’s Thursday night March 21 meeting. Our first feature speaker. Professor David Upham, Associate Professor of Politics at the University of Dallas, will expand upon the 14th Amendment as it applies to our daily lives. Some of the provisions of the 14th Amendment includes, the establishment of religion, the rights of peaceful assembly, due process of law, unwarranted sexual harassment or most recently “right here in Texas a U. S. District judge ruled that the military must draft women”. Dr. Upham will address some of the Supreme Court’s decisions based upon the 14th Amendment. Indeed, an outstanding educational event. George Fuller, Mayor of McKinney TX, will identify concerns about House Bill 2 (Texas Property Tax) with special emphasis on the impact the proposed legislation will have on our citizens and community. To properly understand this property tax initiative you will need to hear Mayor Fuller’s insightful comments. Mark your calendar for Thursday evening March 21. 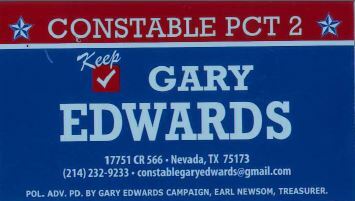 Meet and greet at 6:30 pm with meeting beginning at 7:00 pm at Collin County Republican Headquarters at 2963 W. 15th St Plano TX. Light refreshments will be served. 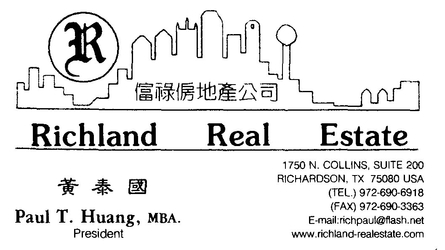 2963 W 15th St Suite #2981 Plano, TX 75075. What is the 14th Amendment and why is it Important? Our March speaker, Dr. David R. Upham, an Associate Professor of Politics and Director of Legal Studies at the University of Dallas, will discuss his published research in the area of American Constitutional History with a particular focus on the 14th Amendment. Dr. Upham will guide us through some of the courts far reaching decisions while reviewing the Constitutional principles. The citizenship clause states that “all persons born or naturalized in the United States and subject to the jurisdiction, thereof, are citizens of the United States” plays an important role in the illegal immigration situation today. For an informative evening mark your calendar for Thursday March 21. Meet and greet begins at 6:30 pm and meeting at 7:00pm. Light refreshments will be served. The CCRMC has reserved three tables at the 2019 Lincoln Day Dinner. 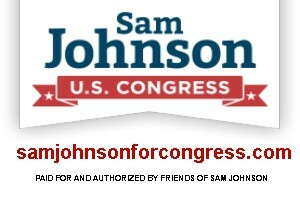 Get a chance to to support the party and listen to a dynamic speaker. 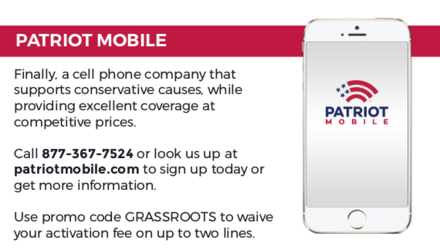 CCRMC Members: To ensure proper seat assignment; If paying by check please make your check payable to the Collin County GOP and either submit your check to Tim McCord OR put a memo on the check that your ticket is part of the CCRMC block of tickets. If ordering on-line by clicking on the image link above please let George Flint or Neal Katz know that your purchase is part of the CCRMC block of tickets. Correction, The tables are 00 not 00. Reserve your Lincoln Day Dinner seats now. The annual Lincoln Day dinner will be held at the brand- new Delta Hotel, at the northwest corner of US 75 and Bethany Drive in Allen on Saturday, March 30. CCRMC has reserved 2 tables for Officers and Members. The cost of each table is 00 and seats eight. 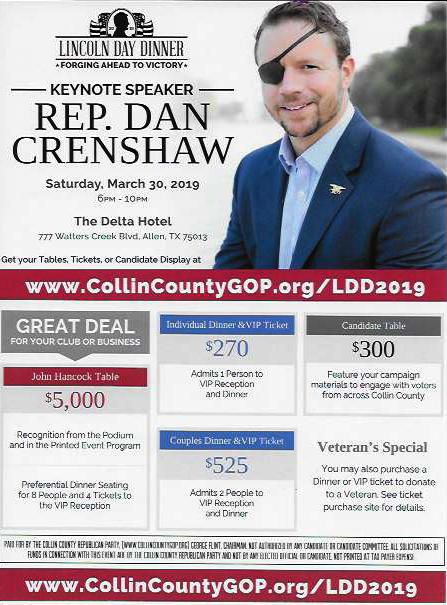 Reserve your seats now and make your check payable to Collin County GOP. Bring your check to our meeting this Thursday, February 21 or you may reserve your seats with Tim McCord. Take your wife to this event. Donations are to be delivered to Headquarters. 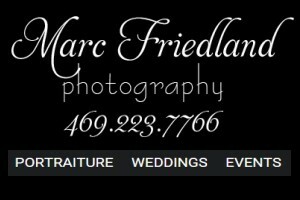 If you have any questions regarding the dinner or the auction, please call me. 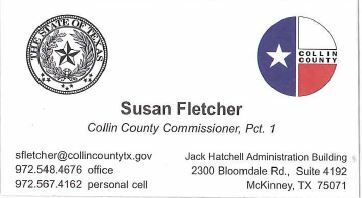 Pam Little, who represents District 12 on The State Board of Education (SBOE), will be Collin County Republican Men’s Club (CCRMC) guest speaker on Thursday, February 21. Mrs. Little, a Republican, was first elected to the State Board of Education in November 2018. Mrs. Little is a Member of the Committee on Instruction which establishes the curriculum and graduation requirements, curriculum implementation, library standards and many other responsibilities. The SBOE priority goals and plans include recruit, support and retain qualified teachers and principals. The Board is constantly building a foundation of Reading and Math, connect High School to Career and College, and improving low performing schools. Again, join us on Thursday, February 21, at Collin County Republican Headquarters at 6:30 pm for meet and greet with meeting beginning at 7:00pm. Light refreshments will be served. We will not be using a CRYSTAL BALL to view the changing horizon appearing in Collin County and Texas regarding political expectations. As usual, our programs are to keep our membership well-informed. Dr. Michael McConachie, Professor of Political Science, Collin College’s Plano Campus will present an analysis of the 2018 Midterm Elections. The presentation is titled, “Meeting Expectations,” and will look at the outcome at both the National and Texas levels. What is the impact of the changing demographics for Collin County and Texas? Lastly, will the trend become more liberal concerning political and social issues? Review New Year’s resolution #4, SEEK TO MEET NEW PEOPLE. 1. STOP PROCRASTINATING: We delay or avoid facing a problem instead of searching for a solution. One way to help is to JOIN CCRMC. 2. DEVELOP CONFIDENCE: Trust you own ability. Take some chances. You will become happier. One way to boost your self-confidence is to JOIN CCRMC. 3. LEARN TO RECOGNIZE STRESS: Our modern lifestyle causes positive and negative stress. Stress can be handled. JOIN CCRMC. 4. SEEK TO MEET NEW PEOPLE: Discover the opportunity of meeting new and interesting people. 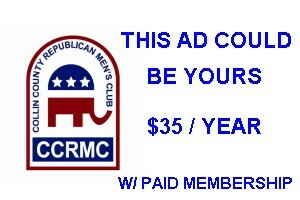 JOIN THE CCRMC. 5. BECOME A LEADER: Help others achieve their goals. Share their journey. JOIN CCRMC. 6. VOLUNTEER YOUR TIME: Help others in your busy lifestyle. JOIN CCRMC. 7. DISCOVER YOURSELF: Explore a new perspective on life which you may never have dreamed possible. JOIN CCRMC. 8. BECOME MORE RESPONSIBLE: Take the time to think before making decisions. JOIN CCRMC. 9. LEARN TO BE HAPPY: It takes patience to find joy. Don’t let problems get you down. JOIN CCRMC. 10. DEVELOP GOOD HABITS: Work on your New Year resolutions until they become a part of your lifestyle. This is true self-improvement. JOIN CCRMC. Mark your calendar for Thursday January 17, 2019. Meet and greet begins at 6:30 pm with meeting beginning at 7:00 pm. Light refreshments will be served. 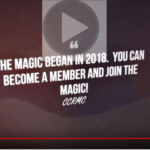 Join the CCRMC! Come join the learning. Pay your dues after September 30th and we include 2019! You can renew as a member, join as a new member with a lapel pin, or buy a grassroots or premium banner ad for a small additional amount.